Some countries, Portugal and Brazil amongst them, have a vibrant cafe society where philosophical and political views can be expressed, debated and dissected without fear or favour. All-comers are welcome to interject or just listen and learn. These are the political salons of the streets, where lecturers, students, journalists, politicians, workers and passers-by can drop by and join in. In Portuguese these encounters are called “tertulias”. It’s been one of life’s great pleasures to take part in these public “tertulias”, whether over coffee and pastries in Lisbon, or caipirinhas in Rio de Janeiro. So why not in Luanda, that other major Lusophone city where political scandal is the order of the day? Linked by their shared colonial history and language, Portugal, Brazil and Angola have all experienced periods of political turbulence but today all three boast modern democratic constitutions guaranteeing freedom of expression and of association. Unfortunately, in Angola the fine words in the constitution are not honoured in letter or spirit. This is not news to Angolans but it took the case of the Luanda Book Club to make it clear to the rest of the world, including Angola’s hapless commercial partners in Portugal and Brazil. You see, a legacy of fear has paralysed most Angolans over the past 40 years and kept them from speaking out. History had shown them that dissent could have serious, even fatal consequences because the ruling MPLA found it difficult (if not impossible) to tolerate. From its early beginnings as an underground anti-colonial movement, through its ascent to power and battles against internal and external enemies, the MPLA has been embattled, defensive and paranoid. As soon as it took power, it faced a civil war from rival movements acting as cold war proxies and before long there were internal divisions too. An alleged uprising by one faction of erstwhile comrades-in-arms on May 27, 1977 resulted in the wholesale slaughter of anyone perceived an an enemy. You were either with, or against, the MPLA. There was no middle ground. The civil war dragged on until 2002: over three decades during which the culture of silence was cemented. Angolans were not free to express any criticism of the government in public, no matter how bad the situation. Any grumbling was restricted to close friends and family, in private, and only when you could be certain not to be overheard. That’s why it’s the younger generation who are in the front line of the debate about freedom of expression and human rights in Angola. Those who came of age after the end of the civil war, after the introduction of democracy with its elections and constitutional rights. They expected a post war freedom and prosperity for all and were outraged that it was denied to all but the favoured few. They went abroad to study, were tech-savvy and aware. They were ashamed that their homeland was a byword for a kleptocratic oligarchy. And then they saw what happened in the so-called ‘Arab Spring’ when dictators who had clung to power for decades were toppled in the space of days by people power. Could that happen in Luanda too? With the naivety and passion of youth, a new generation of Angolans was inspired by the example set by Tunisians, Egyptians and Libyans and they turned to new technology and new forms of expression to follow suit. The Angolan hiphop movement led the way, that perfect vehicle for the poetry of rage and disaffection. They took the streets, hoping the masses would join them. Their demonstrations were banned, disrupted and the participants were hounded and beaten. They persisted. Between demonstrations they made use of all the creative outlets of the modern age: blogs, youtube videos, concerts, radio programmes, facebook pages, twitter feeds. Websites like Central Angola 7311, radio programmes like Zwela Angola and social media offered a creative outlet for this frustrated generation to express their dissatisfaction with the political cadres who were failing to deliver the expected peace dividend. They called themselves the young revolutionaries or Revús, but the a dream of creating a mass movement of young revolutionary Angolans (MJRA) never really coalesced. It was amorphous: people came and went, hopeful of finding those who might share their views and would stand with them. Those with links to existing political organisations hovered on the periphery but their overtures were rejected – the Revús had no time for the politicians they saw as the other face of the same coin. Anyone on the periphery of this ‘scene’ could be described as a Revú. It could be someone who once took part in a demonstration, or someone who dated someone who took part, or someone who read something on Facebook and went along just the once, to see what it was about. It didn’t mean they were actual revolutionaries or that any one of them harboured notions of taking up arms to overthrow the existing government. Hiphop artists Luaty Beirão and Hitler Jessy Chiconde are among the Luanda Book Club. In Lisbon or Rio, their efforts would have been unremarkable and passed under the radar. But not in Luanda, not under a government that only pays lip service to human rights and freedoms. Time and again the outlets to express those dissenting views were curtailed or closed down. Demonstrations banned or violently disrupted, protestors arbitrarily arrested and beaten up by police, radio programmes closed down, independent journals censored or harassed, musicians and rappers barred from giving public performances. Clearly freedom of expression in Angola had strict limits. Their rights and freedoms were being eroded by the day while scandals swirled around how the upper echelons of the ruling party, principally the President and his family, had become so obscenely rich while so many Angolans went hungry or were denied even the most basic medical care. For those disillusioned with then MPLA and all the other existing political parties, desperate for social justice and anxious to find ways to help kickstart change, the safety valves to release their frustrations were gone. The only remaining option was to meet privately to share ideas and learn. That led an assorted bunch to the Kiazele bookstore, amongst them a mole planted by the security services who were watching the hardline activists and the intellectuals who were giving them ideas. On the day of the police swoop in June 2015, it was the great misfortune of one or two of those present to be attending such a meeting for the first time. They have paid very dearly for being in the wrong place at the wrong time. One thing led to another, fuelled by the paranoia of the State Security puppet master with a history of over-reaction to perceived threats, no matter how insignificant,to the status quo. You don’t have to be opposed to the MPLA to guess how this sorry state of affairs snowballed out of control. It only takes a single, all-powerful, General of proven, unquestionable loyalty to President and Party, to insist on striking hard as a lesson to others. They have the power to detain these firebrands and rough them up – that alone will deter many. Then the General’s yes men do what they can to obtain evidence, no matter how flimsy so that very serious charges can be laid. Charge them with plotting armed rebellion, a coup d’etat, call them criminals – no matter what, throw the book at them and see what might stick. 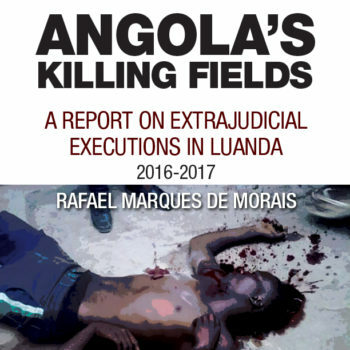 The Justice System in Angola is not independent. Most if not all those in place, from Ministers to civil servants, police, prosecutors and judges are MPLA loyalists. Their livelihood, position in society, relations and friendships are all bound up in a culture of allegiance and compliance. Who would dare to question or stand against the prosecution of these insolent, impudent, profane ‘young Turks’ who disrespect their elders and betters, call them disgusting names and agitate against them? Far easier just to go with the flow. The outcome has further exposed the MPLA and everyone connected to it, to international ridicule and contempt. It must be excruciating for anyone with intelligence to have to try to defend the President, government and party. Angola itself as a nation and a brand is tarnished.